Do Video Games Contribute to Childhood Obesity? An estimated 12.5 million children between the ages of 2 and 19 are obese, according to the U.S. Centers for Disease Control and Prevention. Although genetics and diet play pivotal roles in childhood obesity, the CDC also notes that passive media viewing can contribute to this epidemic. That said, sitting in front of the screen playing video games can play a part in your child developing a weight problem. Before pointing the finger at your child's video game system, blaming it for your formerly little one's growing frame, it's key to understand how and why obesity happens. Although biology plays a role in your child's developing body type, over-consumption of sugary, fattening and overall unhealthy foods -- such as soda or fast food -- can lead to childhood obesity. Additionally, a lack of physical activity can lead to weight gain in children. The CDC recommends that children get at least 60 minutes of aerobic activity each day. Although your child may say that he's "playing" a video game, what he is doing may look more like sitting than other play-type activities. Unlike playing on a playground, playing at the park or playing a sport, playing a video game is largely passive for most children. Similar to TV viewing, the passive aspect of video game play takes away from true physical activity and may lead to weight gain. For example, the American Academy of Pediatrics -- on its HealthyChildren.org website -- notes that children who watch five or more hours of TV per day have a four-and-a-half times greater risk of being overweight than those who watch two hours or less. 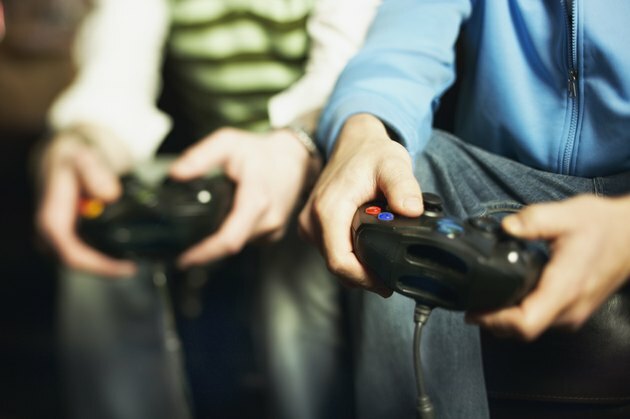 While the sedentary lifestyle that video game players may have would seem to connect to the increased risk of childhood obesity, this isn't always the case. Some research shows that there is little-to-no connection between weight gain and video game play. For example, in a Michigan State University study, psychology professor Linda Jackson looked at the video game playing habits and weight of 482 children. Jackson found no statistical connection between obesity and playing video games. Although a physically active lifestyle is key to a child's health, this study doesn't point to video games as a sole culprit in childhood obesity. Not only are video games not always to blame for childhood obesity, but some experts suggest that children can actually use them to stay physically fit. According to Discovery News, interactive video games that get kids up and moving can help children become more active and lessen the likelihood of weight gain. Vigorously engaging in video games that require the player to make sports-type movements, run in place or dance provides some of the aerobic activity that children need to stay healthy and fit.